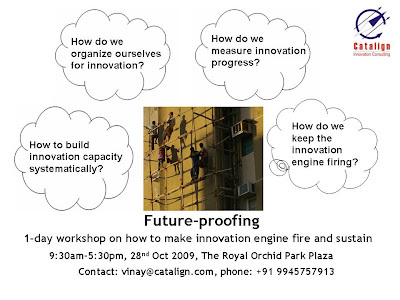 Why a workshop on future-proofing? In the last year or two we all focused on managing cost efficiencies. It was the right thing to do. But as the economy is showing signs of recovery, isn’t it time we start preparing to meet the new future? How do we do it systematically? Understanding how to go about doing this is the primary objective of this workshop. Innovation engine is best understood by contrasting it with its better-known non-identical twin, delivery engine. Delivery engine fulfils current customer demand – productively and efficiently. In contrast, innovation engine (1) anticipates and creates future demand and (2) establishes viability to fulfill it – better than competition. Every organization has an innovation engine in some form or the other. Even your corner grocery store would have one. And it needs to find out how it is going to ready itself to counter onslaught from organized retail stores like More and Spencers and malls like Total Mall. What is the methodology of the workshop? The workshop will be more like carpentry or drama workshop. Focus will be on “learning by doing” rather than “learning by listening”. At the end, each participant would take a few actions with which (s)he can start servicing the innovation engine. For more questions, check out the FAQ. Registration form is available here. Seats are limited and early bird discount is available. You can check out my innovation related articles here.